DENVER, CO - On Thursday, Governor Hickenlooper will lead a hometown send-off event in Denver, alongside Colorado leaders, friends, and musicians, featuring a performance by Nathaniel Rateliff & The Night Sweats. 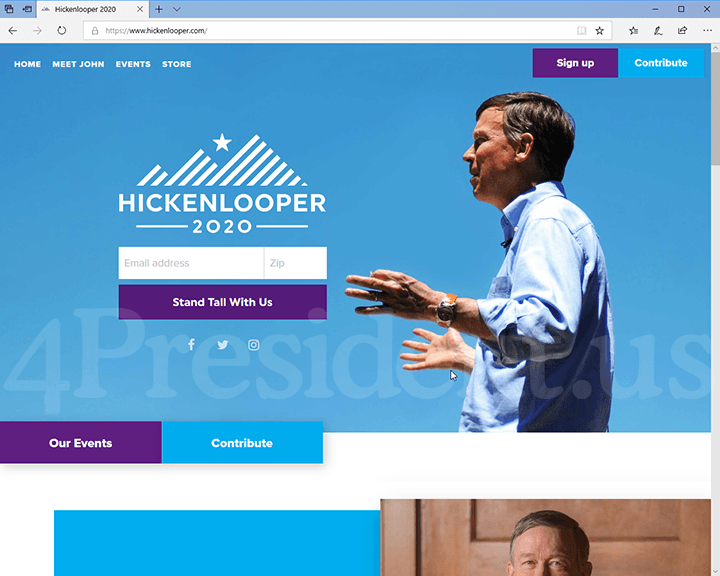 The event will take place at Civic Center Park, which is situated between Denver’s City Hall where Hickenlooper served as Mayor for eight years, and the Colorado State Capitol where he served as Governor for eight years. It is blocks away from the brewpub that helped launch Hickenlooper’s successful career as an entrepreneur and community advocate. Since announcing his candidacy on Monday, Hickenlooper raised over $1 million in less than 24 hours. Below is a copy of Governor Hickenlooper’s prepared remarks. As Americans, we all deserve to feel that hope. We’re a young country in a wondrous, bountiful land, teeming with possibility. We’re innovative, filled with the strength that dwells in the toughest alloys – the magic you get from combining all origins and outlooks into something resilient and wonderful. We have every right to live in a land that’s the home of hope. But these days, that’s not how it feels in America. It feels like we’re living in a heaving crisis - years in the making - spawned by dysfunctional politics - and defined above all by this president. Donald Trump is alienating our allies, ripping away our health care, endangering our planet, and destroying our democracy. The daily insults he hurls range from shocking to unconscionable. But it’s more than his tweet storms. Real people are being hurt: he’s closed down the government. Hate crimes are up. He’s forcibly taking kids from their parents. Most people would call that kidnapping. He measures progress by the number of enemies he creates. He believes that by tearing others down he raises himself up. These are not the metrics of America’s greatness. We are a nation that tracks our progress by the number of working families who end the day feeling more secure about their future. We tally our wins by the number of children who have enough to eat, who feel safe in their homes and in their schools, who have access to the skills for a changing economy. We broadcast America’s values by celebrating those who may not have been born in America - but America was born in them. We gauge our standing in the world by the number of allies who trust us and stand with us through the worst of times. We record America’s greatness by our ability to come together and despite differences achieve bold things for our children and our country. This isn’t about unity for unity’s sake. America stops working when we work against each other. Our country stops making progress when we hunker down on opposite sides of continental divides – Blue and Red; rich and poor; urban and rural. It’s time to end this American crisis of division. It’s time to bring all Americans together. And that’s why I’m running to be President of the United States of America! Now, I understand I’m not the first person in this race or the most well known person in this race. But let me tell you: at 4 syllables and 12 letters, “Hickenlooper” is now the biggest name in the race! Let me tell you something else: growing up as a skinny kid with coke bottle glasses and a funny last name, I’ve dealt with my fair share of bullies. I’m running for president because the only way to end the Trump crisis of division is with a leader who knows how to bring people together and get things done. It’s a strength unique to America, required to solve America’s unique challenges to build a future that every American feels part of. This isn’t just my vision; it’s my record. As Mayor and Governor, I got people to put down their weapons, sit down together, and listen to each other. Really listen - to establish trust, which is always the starting point for collaboration. For those who don’t know Colorado’s recent history, it may seem like our current prosperity was inevitable. But let me tell you, when I took over as Governor, things were upside down. We had just ended the worst year for job seekers in a generation. We were bitterly divided. We couldn’t solve so many of our biggest challenges. But things got worse: the most destructive fires in Colorado history - a mass shooting in Aurora. And then: biblical floods. So many lives lost. I went to 32 funerals those first four years. But in the aftermath of the devastation, the roads and bridges broken, we saw the good was not broken. Instead of resignation, we saw community. Instead of anger, we saw kindness. Instead of despair, we saw neighbors finding ways to reach one another. Lending a hand. Lending a truck. Listening. Helping. That’s how we rebuilt, better than before. That’s how we went on to chart an entirely new course for our state. And that’s how we overcame the recession. We expanded medicaid with bipartisan support … built one of the most innovative healthcare exchanges in the country. And as a result … nearly ninety-five percent of our people now have healthcare coverage. After Aurora, we stood up to the NRA … and we passed universal background checks and limits on high capacity magazines … in a Western state. We brought environmentalists and industry into the same room to sit down and craft the toughest methane regulations in America … the equivalent of taking 320,000 cars off the road every year. More than a year of negotiation … but in the end oil and gas agreed to pay for it. We brought cities and suburbs and rural counties together and created a progressive water plan that made sense for everyone. We invested in high-quality pre-K ... scholarships for young adults who couldn’t afford college … apprenticeships … light rail … and so much more. And in just eight years moved from 40th in job growth to the number one economy in America. That’s what you can do when you bring people together. And there was another secret ingredient: sheer persistence. I learned persistence the hard way. I lost my dad when I was eight. Shortly after moving to Colorado in the 1980s, I lost my job and my career as a geologist during the recession. A whole profession disappeared for almost a whole generation. I was unemployed for two years. And when you’re unemployed for that long, you see a different person in the mirror. With two friends, we got a library book on how to write a business plan. And 34 investors and 3 loans later, we started a brewpub in an abandoned, forgotten part of Denver. Our persistence paid off, and the brewery took off. An entire neighborhood grew around it. And in our first ten years opening breweries across the midwest we said “you’re hired” more than 1,000 times. The best part of this story? It’s not unique. Our small businesses spawned others, and, in turn, helped create vibrant communities. We succeeded because we worked hard and built alliances with other businesses. We played a part in revitalizing communities. And now it’s time to do that for all of America. Defeating Trump is absolutely essential. But it’s not sufficient. We need to walk out of this canyon of division to a higher plane of progress. America is ready. And I know I’m ready. When I’m President, we will declare as a country that healthcare is a right. This means universal, affordable coverage … where everyone has a doctor who knows them and knows their family. Where everyone can get a checkup. A real medical home. We will declare as a country that everyone deserves to share in the benefits of being an American. To get there, everyone has to pay their fair share: we will close the loopholes, end tax cuts for the wealthy, and we will ensure every profitable corporation is carrying their weight. We’ll bring the same relentless innovation we used to land on the moon to save our planet. We’ll reclaim our global leadership. And the first thing we’re going to do is rejoin the Paris climate accord and exceed its goals. And we will build a green economy that creates jobs that can’t be shipped overseas, while combating generations of climate change. We’ll create a whole new understanding about the future of work. The majority of today’s young adults who want tomorrow’s skills will be able to shape a 21st-century economy with better jobs. By bringing unions, good corporate citizens and schools together we’ll invest in the largest expansion of skills training and community colleges in our country’s history. In the next two years Colorado will have broadband connecting every single school, hospital and town across the state. Universal broadband will instantly become national policy when I’m elected. We’ll renew our commitment to the fundamental strength behind American success. It’s right there in the Great Seal of our country: Out of many one. This promise is predicated on the fact that we are all created equal in the eyes of God. And that equality demands social justice for everyone of us. And we’ll renew our commitment to a reformed justice system that addresses our long history of slavery, segregation and racial bias. We’ll undo years of efforts to disenfranchise African American voters and Latino voters and even young voters. And end this assault on the foundations of our democracy. We’ll make it easier for every qualified voter to register and vote because the ultimate power in America should reside in the hands of the people – all the people. At the end of my presidency, I want Americans to say: it feels like the cloud has lifted, we feel closer to our neighbors and we’ve gotten big things done. And we feel hope. Just imagine how different our country will feel when we start moving toward each other again. Imagine, a country where families go to bed knowing a serious illness won’t hurtle them into bankruptcy. Imagine, a world where our young people are part of a new “greatest generation” – the one that helps save our planet. Imagine, a new American economy where anyone can be whatever they want, whenever they want, wherever they want. Are these big dreams? Sure. But my story is proof that big dreams can be made real. It’s one of America’s great talents building dreams tomorrow we didn’t know were possible today. I’m proud to be part of a political party that over decades has rallied to the call of so many dreams and dreamers - like King’s vision of a country where children are judged not by the color of their skin but by the content of their character. I’m also proud to be in the party that not only dared to dream big dreams but had the persistence to get them done - from creating Social Security and Medicare to enacting civil rights and putting a man on the moon. That’s the other half of my DNA: I am a dreamer and a do-er. And we need both to make real progress. Not just big ideas but making them happen - finding common ground when it seems like there’s nothing there but mountains between us. Being a pragmatist doesn’t mean saying ‘no’ to bold ideas; it means knowing how to make them happen. And that will be my promise as President. No one person can heal the fractures in America today. But if enough of us accept the challenge, if we work hard enough, we can make the impossible, possible. Together, we can turn this winter of division into a season of hope.